This mandala incorporates the 6 pointed star as the central symbol. 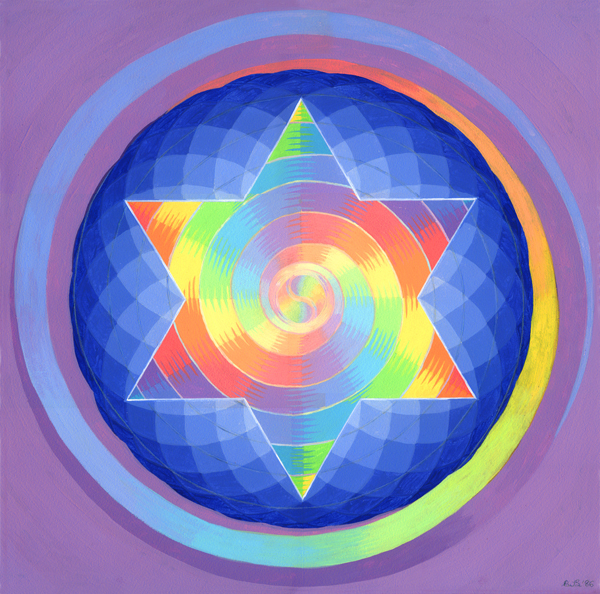 This hexagonal star is widely used for meditation and represents the ascending and descending energies coming together to form One Unity in perfect balance. Although often associated with the Jewish tradition the 6 pointed star occurs widely throughout the world in a variety of cultures. Furthermore it is found widely in nature as a universal pattern in for example snow flakes and daffodils. In this image the spiral is present moving through the spectrum giving a sense of circular unfoldment through the different colours. This symbol is a powerful tool for centring and balancing ones energies.